Black Cumin Seed Oil - A Traditional Alleviation To So Many Ailments! THE ORIGINAL AND BEST BLACK CUMIN SEED OIL IN THE WORLD. Hold on to the use of the black seed for indeed it has a remedy for every disease except death. We are specialists in black cumin seed oil having produced the oil since 2002 and with the help of Medical Herbalist Antoine Pouget we have identified the important ingredients in black cumin seed oil. Our strong oil has a very high amount of volatile oil. The amount of volatile oil differs depending on the hybrid and where the seed is grown. For countries with extreme heat the content of volatile oil is increased. One of the important components that makes black cumin seed oil so unique is the content of volatile oil. Black cumin seed oil normally contains between 0.5% to 1.2%. Our oil is 100% pure virgin quality cold pressed black seed oil. Our strong black seed oil which has about 4.3% is unique to the market. Almost all black cumin seed oil will have a certain amount of volatile oil in its content. This volatile oil is what makes the oil pungent, noticeably our product is more pungent. DISCLAIMER: Please note that these applications are taken from traditional and modern applications. In the case of illness one should always contact a physician to be absolutely sure. The statements made here have not been evaluated by the FDA, and as such, shall not be construed as medical advice, implied or otherwise. "I feel good and I hope many more will use the Blessed seed Oil and benefit from it." - Syed K I Shah FRCSI, Orthopaedic Surgeon Lancashire Teaching Hospitals, UK. Our black seed oil is special due to the high content of volatile oil (which most researchers have concentrated in their studies of how black seed oil works). This is important for immune system support, rheumatism, inflammation, high blood pressure, allergies, candida, thrombosis, parasites, salmonella (food poisoning) and many, many more. 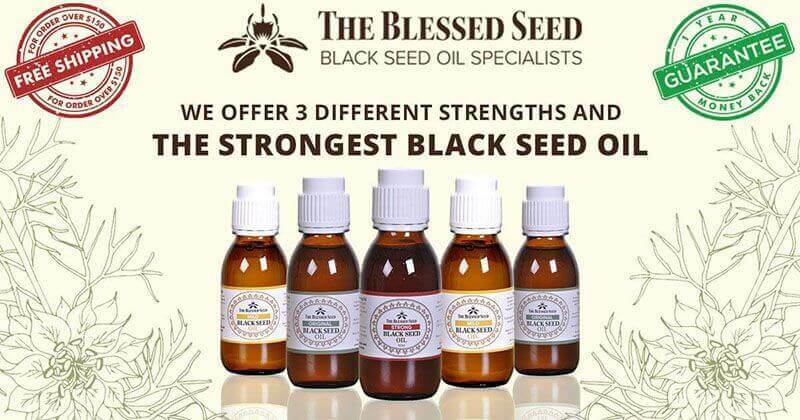 We’re proud to be unique in offering such a high quality oil, and assure you – if you’re looking for the strongest Black Seed Oil available, this is the only oil you should be considering. We’ll even pay the costs of sending the products back to us (which may be a completely empty bottle), with no questions asked. No other company dares to offer this. We do, because we know our product works! "As soon as I applied it, I felt relief! The oil cleared up the candida within a week, and my skin colour is back to normal!"